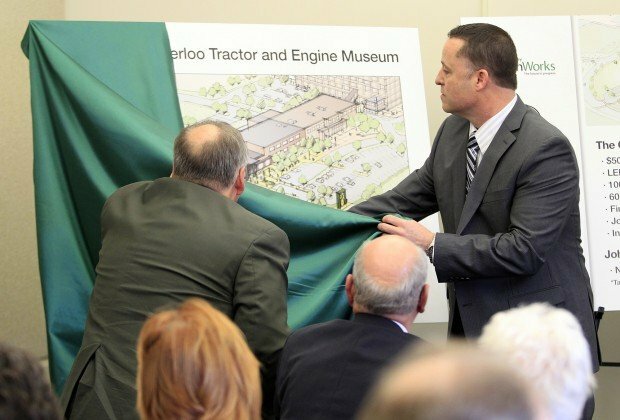 Steve Dust, left, helps John Deere Waterloo Works Factory Manager Thad Nevitt unveil plans for the Waterloo Tractor and Engine Museum at TechWorks in Waterloo Jan. 31, 2012. WATERLOO, Iowa --- For local officials, Cedar Valley TechWorks has been the center of their dream of rebuilding downtown Waterloo. That dream took a major step toward reality today with the announcement of a $50 million project that will transform the 40-acre parcel of land on the western edge of downtown into a center for business, manufacturing and tourism, according to officials. The centerpiece will be the renovated "Tech 2" building --- donated to the city by John Deere --- including a 100-room hotel and restaurant complex and "green" office space. Plans for The Green @ TechWorks and the John Deere Waterloo Tractor and Engine Museum were unveiled today. The announcment was made at the TechWorks campus by leaders from the city, Deere & Co., the Greater Cedar Valley Alliance & Chamber with Rodney Blackwell of Davenport-based investor FDP Properties and Brian Vandewalle of Davenport-based redeveloper Vandewalle & Associates Inc. Together with renaissance projects along the Cedar River, the project is a keystone of the downtown redevelopment. Those projects include a river walk, amphitheater and housing --- and redevelopment of areas surrounding the Five Sullivan Brothers Convention Center, including the new SportsPlex and the old Courier building. "We've been talking about TechWorks since before I got here almost eight years ago, and plans for downtown redevelopment have stretched back farther than that, when Waterloo began to get very serious about renewing the downtown area and revitalizing its core, and now we've begun to see the fruits of that," said Steve Dust, CEO of the Greater Cedar Valley Alliance & Chamber and president of TechWorks. "We've always talked about the monumental development project that's required to really get the downtown revitalization process moving with the private and public sector, and here it is." Multi-purpose projects across the TechWorks campus, including an "upscale" 100-room hotel-restaurant complex in the "Tech 2" building, focused on the needs of business travelers and tourists. Developers said the hotel would be run under a major national banner but did not disclose the brand because the contract has not been awarded to one of two finalists. The Russell Wasendorf family, which owns PFGBest in Cedar Falls and runs the My Verona restaurant in downtown Cedar Falls, will have "primary interest" in the restaurant, Dust said. "Class A" showroom and office space in Tech 2. A new fully equipped training center for John Deere employees. The Deere museum, which is scheduled to open in the spring of 2013. Commitment to redevelop Waterloo's "Main & Main" location at Fourth and Commercial streets around the convention center. A "green zone" of industrial and commercial business activity, designed to Leadership in Energy and Environmental Design (LEED) standards --- with the "Gold" level being the goal --- and powered by a wind/solar energy system, with an eye toward attracting more "green-oriented" businesses, Deere suppliers and others. Continuing work on a manufacturing prospect that would occupy 25,000 square feet of space in Tech 1, the Advanced Technology & Energy Center and additional projects to be delivered over the next 10 years across the campus and downtown. "The mission for the Tech 1 building remains the same," Dust said. "This is going to be the center for production in research and development on various types of products, but more of a manufacturing environment." Construction on the project is planned to begin in late August or early September, with expected completion about a year later, Blackwell said. The plan received quick approval at a city council meeting Monday night. "It wouldn't happen without that kind of developer," Waterloo Mayor Buck Clark said. Dust said getting the development agreement was crucial for FDP to pursue new tax credits, as well as historic rehabilitation credits for the projects. A plan will be brought to Waterloo's Planning and Zoning Commission for approval of site plan and other details. Clark said Blackwell's vision is making it happen. "We bring him to town to look at something else, and he drives by this old industrial building that's a shell and said, 'That's the one I want.'" Blackwell said a first glance at the TechWorks buildings immediately drew him in. "I used to and still specialize in old real estate, and the bones of that building are incredible," he said. "It's easy to adapt in my mind. I can visualize what we can do with it. Even more amazingly, Brian found a photo of something identical to what we're going to try and capture there. I think that gives a flavor and flair for what we're trying to pull off." Talk has been rampant for the last couple of years that other tenants would join the University of Northern Iowa's National Ag-Based Lubricants Center as tenants in Tech 1. At least one other tenant is on the cusp of announcing intentions to move into the building, said Cary Darrah, TechWorks general manager. "We'd hope to do that in 30 days. We've been in discussion," she said. " They're committed in other areas of this project." She named two alternative-energy companies --- Marin, Calif.-based solar firm iPower and Toronto-based wind turbine company Cleanfield Energy --- as two active participants. Dust acknowledged development of the TechWorks project has not gone as quickly as had been hoped, but he said that is now bound to change. "One of the reasons it hasn't already snowballed is, we, as TechWorks, have not been able to access the capital to prepare the space for the businesses to occupy," he said. "This development solves a lot of that, as it relates to the T2 (Tech 2). As I said earlier, it's delivering the entire T2 building --- half of it dedicated to the hotel and half dedicated to a new kind of space that we have not seen in this marketplace before." Blackwell credited Deere, which originally donated the two six-story former manufacturing plants and 40-acre parcels of land to the project in 2007. "I think Deere has kind of inspired it," he said. "I just liked the building. It will be alive again." So will other parts of downtown Waterloo, Clark noted. "Boy, what an exciting time for Waterloo," he said. "If you stop to think about all the things that we either already have or are going to be announcing just in downtown, it's incredible." 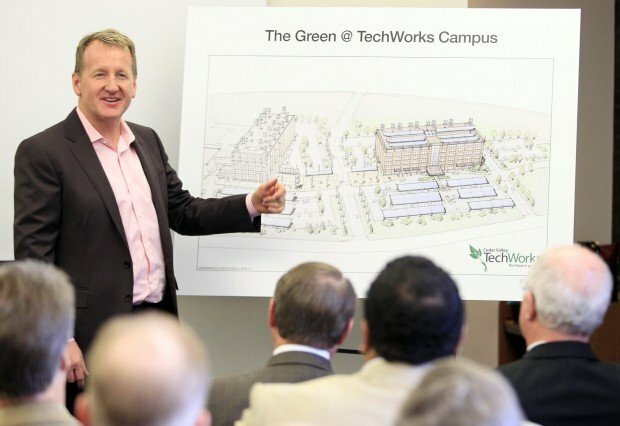 WATERLOO, Iowa --- Mayor Buck Clark said taxpayers won't be on the hook for a grant to help develop The Green @ TechWorks. WATERLOO, Iowa --- Project leaders for Cedar Valley TechWorks announced two partnerships at the ongoing downtown development project Thursday. New hotel hint--Tom Bodett says "We'll leave the lights on"
I'm just amazed that nothing ever even promotes a discussion? Not a question, not a concern. Is this council violating the open meetings law, or are they just making mindless decisions? dm1 - You are so wrong! If you don't like it here, then leave. So many poisitive changes are taking place in Waterloo and I am so proud to call Waterloo my home. Negativity does not belong in Waterloo - just the positive people that have the vision on where we are going and how much greater we will be. Yeah to Waterloo!! I don't know if this project is the best for Waterloo but I do know this. Many years ago when I was part of the Cedar Rapids community many people complained about the Stouffers hotel going in. They complained about the airport expansion. They complained even about the Interstate going through town. Even recently they complained about the expansion of St. Lukes medical facility. Look at CR now and look at the Loo. I commend the present administration for their vision and hard work. You really have to give credit to John Deere, not only are they a great asett to Waterloo but they are willing to invest millions of dollars to improve the downtown area for the better of Waterloo. Why are we spending a dime of public money on this? It is about time Waterloo looks forward and digs itself out of the cesspool thinking shown here by 'dm1' and 'Iowacardfan'. Their type of thinking has literally dragged Waterloo down since the demise of Rath Packing, and it is time we let the past be the past and get busy to put Waterloo on the cutting edge. Waterloo can wallow and cry, oh my, or it can stand up and look forward. This is a great step forward; kudos to the positive thinkers, and ***** to the naysayer negative stick in the muds who probably haven't contributes a thing to society sincy they escaped the womb. It would be nice to see the city get more involved in advancing its well-being, but thank you to Deere and TechWorks. As someone who worked in Plant Engineering at the downtown site, the video shows some physical modifications that are not structurally possible, but the spirit of the renovation is well represented; I can't wait to see it realized. I don't think I am negative nor a naysayer, but our city officials enter into these agreements and who knows whether it is a good thing or not. Who knows where we stand on bonded indebtedness? Who are these people? Have the completed developments in other places? Why would we agree that they need to maintain $15.5 million in assessed value when we are putting in $12 million and they are investing $40 million? If Tech Works is a good project, why have we never been able to attract any businesses there? Many of us are concerned about our tax base and high tax rate. None of these projects will do anything to help our tax base. They all have abatements for years to come. Just as we may need an attractive downtown area, we need enough money in our budget to provide good city services. Waterloo residents have tried to support what's right--look at all the beautiful schools we have. We tried to do what was needed to improve the schools--even if it didn't work. Maybe Waterloo will turn out to be such a good place to live that all the city employees will move back here. To Gloria: You make good points; kudos. I'm just saying this project is a step in the right direction. I was raised in Waterloo, but now live in a retirement community 500 miles away. Many people here are from Iowa, and every one of them avoids even going near Waterloo. There's a reason. Waterloo has serious potential to turn things around as they have demonstrated. It takes many, many steps, and years to make these things happen. So many people are so shortsighted; these projects are measured in decades, not months. If this makes property taxes go up I am not going to be a happy camper. "Green" jobs, that they don't even have solid contracts with? What if they set this all up, blow all this cash and no one moves in? How good are "green" businesses doing? Solyndra, oh yeah, that did great(NOT--BANKRUPT! ), how about that "green" chevy car, sold millions right? nope... Sounds like a DUMB idea. "green" is just a fad, climate change is just a scam, and these dupes are falling for it. None of this will happen. Someone will get rich off of it though, I can guarantee that. Wow! Good job Waterloo and Cedar Valley! That's the kind of project that will really help businesses like us looking for new people to move here, and giving kids more reasons to stay in a cool city. Thank you Deere for another investment here! I think Jimbo and Gloria both bring up good points. There is also a great project in South Waterloo with the Bertch's huge investment in Bamboo Ridge. A lake with an island, beaches and paddle boats. 175 campsites and cabins. These are all good things. Property taxes go up at an unacceptable rate regardless of what gets done. We need to challenge our city leaders on that hard rather then sit back and take a "that's just the way it is" attitude. Should the City be using tax dollars to support a competitor to other downtown hotels? The Ramada and Clarion are both in bad shape, could this project be the nail in their coffins then we'd have more empty/useless buildings downtown. And why support new office spaces with tax $ when there are huge properties sitting empty (AT&T for one)? Won't this just depress prices by oversupplying the market? While I agree the City needs to improve the downtown, they should stick to infrastructure and leave business decisions to businesses. The only ones guaranteed to win here are the developers (2 ppl). [quote]Dave88 said: " There is also a great project in South Waterloo with the Bertch's huge investment in Bamboo Ridge. A lake with an island, beaches and paddle boats. 175 campsites and cabins. These are all good things. "[/quote]------------------------------Also I didn't hear the Bertches demanding taxpayer money or incentive to do the project. The Bertches truely care about Waterloo not just their own egos at someone elses expense. Yes they do, as do others. But I read lots of complaints against the Bertchs' on this very site. Some people are just never happy-about anything. I have to believe there are other cities with people who complain about everything, don't want progress of any kind, are shortsighted, unimaginative and are NIMBY folks...but I swear to God the Cedar Valley seems to be full to the brim with this kind of citizen. It's sad too, because we've fallen so far behind. I think the reason there are a lot of people writing negative comments about our city government is because there is and should be a natural distrust of politians who have access to other peoples money and are subject to all kinds of pressure from those that have influence and want the money. This is true locally, at the state and Federal level. You know that the politians would be a lot less quick to act if it was there money or if they were liable for any failures like the dog track. Just read my last post. Should be "their" not there !! This project as i read it is a secure, creative use of the city's powers. Gosh what an addition! That old Ramada needs some help to go ahead and leave so new business and conventions will come! If that were true, the casino would have been built downtown and would have served as the anchor for all of the revitilization occuring downtown.